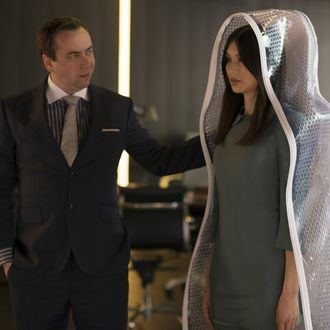 On AMC’s compelling new drama Humans, robots (built to look just like us!) can be home-ordered to mechanically help with the housework. Sold! Just one thing — some of them start to develop consciousness and become preoccupied with activities like staring longingly at the moon and getting a little too close to your daughter. In this exclusive clip from this Sunday’s episode, Laura becomes increasingly terrified of her family “synth,” Anita, when she spooks the bejeezus out of her. Humans airs Sunday nights at 9 p.m. EST on AMC.